Everyone Needs lights, especially here in Portland or you will get a big ticket from the police. Luckily for us Michael at KNOG and Matt at Cyclone were nice enough to hook the crew up with a ton of lights, as well as some bags and some gloves to help us get around. Fresh Bags are always good! Especially one with drawing of naked chicks! If you’re in the market for a new bag be sure to check out the Bags from KNOG, they have big strong buckles and will be resistant to Portland’s wonderful rain. The beetle lights are also bright as can be and are available in white and red for the front and back! After 2 weeks on the road we are back in Portland. Above is a shot of Max Anderson Young Airing out of a bank in Lincoln Nebraska. We went through through 8 states, 2 cars, 50 blunts, a bunch of parks, and a ton of floors. Thanks to anyone who put us up! More pics to come! I also printed up some GIANT SIZED stickers so get at me if you want them. This Man can CanCan!!!! 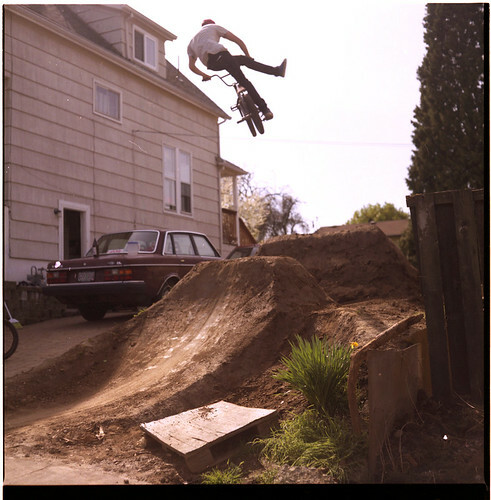 Max Anderson-Young killing in the front yard after a long winter of digging in the rain.